To succeed today, companies need a a unique value proposition that incorporates digital technologies in a way that is difficult for competitors to replicate. As leading technology companies embrace biometrics, artificial intelligence (AI), drones, and other exciting digital technologies, senior business executives at many other companies feel pressured to do the same. But if they are to maximize the value from investment in new technologies, business leaders first must make sure that their companies have a great digital strategy. We studied digital strategies as part of a research project on designing digital organizations that the MIT Center for Information Systems Research conducted in partnership with The Boston Consulting Group; in that project, we interviewed more than 70 senior executives at 27 companies. Our findings underscored the importance of developing a winning business strategy that takes advantage of digital technologies. A great digital strategy provides direction, enabling executives to lead digital initiatives, gauge their progress, and then redirect those efforts as needed. 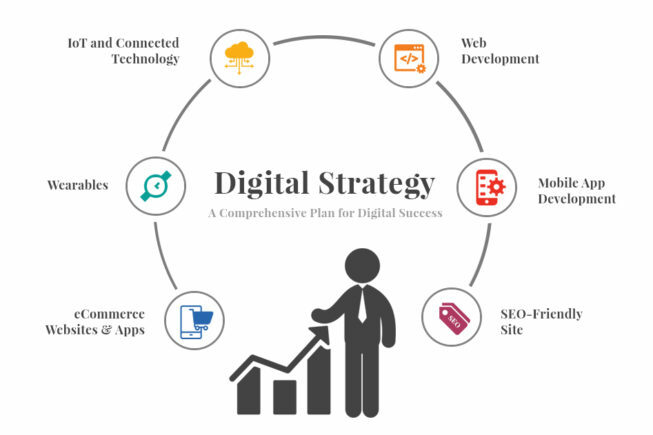 The first step in setting this direction is to decide what kind of digital strategy to pursue: a customer engagement strategy or a digitized solutions strategy. A customer engagement strategy targets superior, personalized experiences that engender customer loyalty. A digitized solutions strategy targets information-enriched products and services that deliver new value for customers. The best strategy for a company will depend on its existing capabilities and the way it wants to compete. The most important requirement for a great digital strategy, however, is to choose one kind of strategy or the other, not both. A digital strategy aimed at operational excellence may appear to be a third choice, but increasingly, operational excellence is the minimum requirement for doing business digitally, not the basis for a sustainable competitive advantage. The focus of a customer engagement strategy is the development of customer loyalty and trust – and, in the best cases, passion. Companies choosing this approach offer seamless, omnichannel customer experiences, rapid responses to new customer demands, and personalized relationships built upon deep customer insights. Recognizing the always-rising bar of customer expectations, companies with a great customer engagement strategy are constantly identifying new opportunities to connect with their customers. Kaiser Permanente, an integrated provider of health care and not-for-profit health plans based in Oakland, California, is following a customer engagement strategy. Driven by what it calls its “consumer digital strategy,” Kaiser Permanente approaches health care as a collaboration between care providers and members. It uses digital technologies to provide seamless, low-cost access to provider teams and to facilitate the delivery of both curative and preventive patient care. Offering digital channels that bolster patient interaction with care delivery teams. Kaiser Permanente’s channels provide access to personal health records, secure messaging between patients and providers, and remote care. Applying data analytics to identify the need for – and the most effective approach to – personalized medical outreach. Kaiser Permanente uses analytics to track and improve patient compliance with medication and treatment regimens, and to identify the most effective forms of outreach for generating healthy behaviors. Leveraging social media to develop communities of patients with similar interests and needs, and to create “care circles”, where patients and their families can engage with care providers. Kaiser Permanente is using a carefully crafted permission system to allow approved family members and other caregivers to help support patients, communicate with their physicians, and monitor their treatment. As a result of these efforts, 70% of Kaiser Permanente’s members are actively engaged in managing their health online — a behavior that the organization’s research indicates is positively correlated with better member health, adherence to treatment regimens, satisfaction, and retention. A digitized solutions strategy transforms what a company is selling. It seeks to integrate diversified products and services into solutions, to enhance products and services with information and expertise that help solve customer problems, and to add value throughout the life cycle of products and services. Over time, digitized solutions can transform a company’s business model by shifting the basis of its revenue stream from transactional sales to sophisticated, value-laden offerings that produce recurring revenue. Schindler Group, a global provider of elevators, escalators, and related services based in Ebikon, Switzerland, is pursuing a digitized solutions strategy. The company leverages the internet of things — collecting real-time data from its installed base of elevators and escalators and using that data to improve the quality of its products and services. Initially, Schindler focused on operational excellence in its digital strategy — using analytics to reduce the costs it incurred in servicing its products. But all four global competitors in the industry are improving their operations in this way. So, Schindler shifted its focus to digitized solutions and began using data from the internet of things to help prevent equipment failure, optimize elevator routes, and identify potentially valuable innovations. Schindler has developed a new urban mobility solutions strategy that takes advantage of its ability to manage the efficient movement of thousands of people within a building. For example, the company has developed a digitized solution that allows visitors to bypass lobby security stations by swiping their mobile phones at the point of entry. Although customer engagement and digitized solutions strategies are very different digital strategies, their paths will invariably converge over time. For example, Kaiser Permanente’s pursuit of customer engagement has led to the development of remote monitoring services, a digitized solution. Similarly, Schindler is deploying a mobile app that communicates the real-time status of elevators and escalators to facility managers, enhancing customer engagement. But this convergence doesn’t obviate the need to choose between the two types of digital strategies. Companies need a clear digital strategy to develop an integrated portfolio of customer offerings. Their employees need a clear strategy to guide their innovation initiatives and resolve debates over priorities. Thus, the strategy predetermines the winner in stalemates between product and customer factions within a company, and it discourages functional silos from pursuing independent goals. For example, financial services company USAA, based in San Antonio, Texas, has generated outstanding net promoter scores by restricting the development (and acquisition) of financial products to those that can be integrated into a seamless customer experience. The company’s customer engagement strategy drives the innovation agenda, and its digitized solutions must conform to that strategy. At Apple Inc., in contrast, a digitized solution strategy drives innovation. The company expects customer-facing employees to deliver a great customer experience, but the product comes first, even if that means employees must convince reluctant customers that they don’t need a headphone plug. At both USAA and Apple, the choice of digital strategy provides a shared understanding of business objectives among employees, and it guides experimentation and innovation. To exploit the numerous opportunities for delivering on either type of digital strategy, a company also needs an integrated platform of distinctive capabilities — we call it an operational backbone — that ensures efficient, reliable transactions and customer interactions. These capabilities vary by company, but they typically include things like access to a single authoritative source of information for key data about finances, customers and products; reliable end-to-end global supply chain processes; or back office shared services. Companies have been trying — and struggling — to build such operational backbones since the 1990s, when they started implementing enterprise resource planning (ERP) software and customer relationship management (CRM) systems. In many cases, organizational politics, cultures, and processes reinforced existing business silos, which hindered implementation of these systems and the accompanying enterprise-wide capabilities. But a company that lacks enterprise capabilities will not be able to deliver reliable operations and thus will not be able to compete digitally. Kaiser Permanente’s operational backbone starts with its electronic health records system. Kaiser Permanente committed early on to electronic health records as the basis for clinical record keeping and collaboration. Now, its health records system facilitates increasingly meaningful patient interactions, and it enables new digital initiatives that require accurate, accessible patient data. Schindler’s operational backbone comprises the global business technology and process standards that it implemented with its ERP system starting in 2005. Now, as the company supplements its operational backbone with sensor data, it facilitates the company’s ongoing mobility solutions experiments. In assessing their company’s ability to execute one of the two digital strategies, business executives must be mindful of the gaps in their capabilities — and then, as quickly as possible, wire them into the organization’s operational backbone. To succeed in the digital economy, companies must offer a unique value proposition that is difficult for both established competitors and startups to replicate. Such a value proposition stems from a digital strategy that is focused on either a set of digitized, integrated offerings or a relationship that engages customers in ways that competitors can’t match. Without that, you might create a flurry of innovations, but you won’t deliver value-added applications of AI, biometrics, drones — or the next important digital technology. Jeanne W. Ross is a principal research scientist at the MIT Center for Information Systems Research in Cambridge, Massachusetts. Ina M. Sebastian is a research associate at the MIT Center for Information Systems Research. Cynthia M. Beath is a professor emerita of information systems at the McCombs School of Business at the University of Texas at Austin.